The Smooth-Bark Arizona Cypress is an evergreen that grows at elevations between 3500 - 5500 ft. Its most distinguishing feature is its bark, which sheds as the tree matures, revealing the smooth, dark reddish inner bark that gives the tree its name. 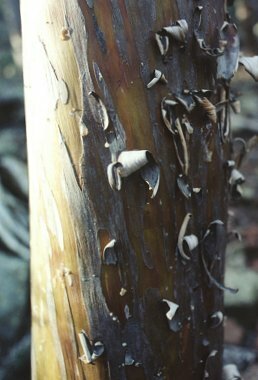 This picture was taken in the Mazatzal Wilderness, where several nice stands of Smooth-Bark Arizona Cypress may be found. Like most cypress & juniper, the tree has thick, blue-green, scale-like, evergreen leaves. Cones are round and woody to 1 inch in diameter. They open when mature and may remain attached to the tree for a number of years.